Anaerobic digestion can be used in a number of different forms. As in the case of aerobic fermentation, the bacterial culture can be developed as a suspended growth or as a fixed growth on a substrate. to stabilise various waste, including the organic fraction of domestic waste and green waste. The frequently fragile structure of anaerobic sludge and the gas generated within this sludge (CO2, CH4) make floc separation far more difficult than in the aerobic phase. Extensive clarifiers in liquid effluent treatment will be required and thorough floc degassing (passed through a vacuum chamber). Subject to this condition, the sludge can be recycled and we can use reactors that have a capacity of up to 10-15 g · L– 1 of sludge and thus apply loadings that vary from 2 to 12 kg COD · m–3·d–1 of digester. In sludge treatment applications, up to 2.5 kg of VS · m–3·d–1 can be introduced into a high loading anaerobic mesophilic digester. The option of granulating anaerobic biomasses can also be used with suspended cultures. The "granules" are compact bacteria aggregates measuring between 2 and 8 mm (photo 5). The way in which these granules are formed is far from being clear. The role played by inert micro-particles in initiating granulation has been highlighted. The importance of calcium concentration (over 100 mg · L–1) as part of the granule consolidation phenomena has often been reported. The presence of starch is another favourable element. These granules have excellent sedimentation properties (15 to 80 m · h–1), which allows them to be used in a sludge blanket through which the liquid to be treated flows upwards without noticeably carrying away any of the granules. Nowadays, this process, called "UASB" (upflow anaerobic sludge blanket) includes the Anapulse degremont® (see anapulse (sludge blanket digester)) and is the one most widely used in effluent methanisation. It enables us to eliminate from 8 to 15 kg COD · m–3·d–1. More recent processes use these same granules in triphasic turbulent beds, generate more intensive exchanges between the substrate and the biomass, thus treating up to 20-30 kg COD · m–3·d–1. the first phase could inhibit the second. risk of sulphates reduction for S concentrations in excess of 200 mg · L–1 (H2S is toxic for the acetogenesis-methanogenesis stage). 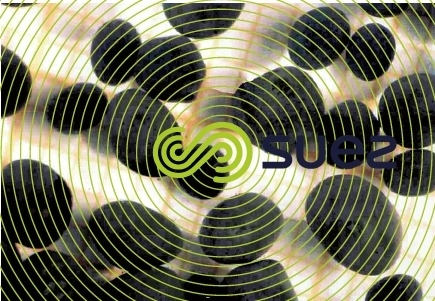 Applied to sludge digestion, this system offers the possibility of a more compact system (see liquid sludge stabilisation). The supports used normally have a granulometry of a few hundred micrometres. They are expanded by the water current and by a rising gas flow. These reactors, which include the degremont® Anaflux (see anaflux (attached growth in fluidized beds)) provide an excellent substrate-culture exchange and a high active biomass concentration. Their organic loadings can reach 50 kg· m–3 · d–1 of COD or even more with some effluents. A comprehensive understanding of the triphasic system’s hydraulics is essential for avoiding non-fluidised zones. Bacterial mass growth must also be checked in order to prevent the biomass from excessively lightening the support matter to which it is attached either because the bed has undergone abnormal expansion or because of its excess flow, resulting in both cases in loss of sludge and support material.